Departure from C.S.T. for Sindhudurg Railway Station 16.40 hrs. Arrive at Sindhudurg station 07.30 hrs. Detrain for Malvan Jetty by A/c.Coach 08.00 hrs. Visit Sindhudurg Fort by boat 09.30 hrs. Return to depart for the Tarkarli Resort 11.30 hrs. Arrive at Tarkarli Beach Resort 12.00 hrs. Lunch & Leisure time up to 15.30 hrs. Depart for Dhamapur village by A/c coach On way visit to Cashew factory. 15.45 hrs. Arrive at Dhamapur Village. 16.45 hrs. Visit to Ancient Temple of Goddess Bhagawati and Sateri Devi and Dhamapur lake. 16.45 hrs. to 17.30 hrs. Depart by coach to Kudal Railway Station. 17.45 hrs. Return to Deccan Odyssey train. 18.15 hrs. Depart for Goa. 18.30 hrs. Dinner on board. 20.00 hrs. Arrive at Karmali Railway Station 07.30 hrs. Detrain for sightseeing by A/c. coach for Old Goa visit to St. Augustine Church, Basilica of Bom Jesus Church, Se Cathedral Church, St.Francis of Assissi a Museum of Goan antiques and visit to Fontanhas the Latin quarters at Panjim. 08.00 hrs. 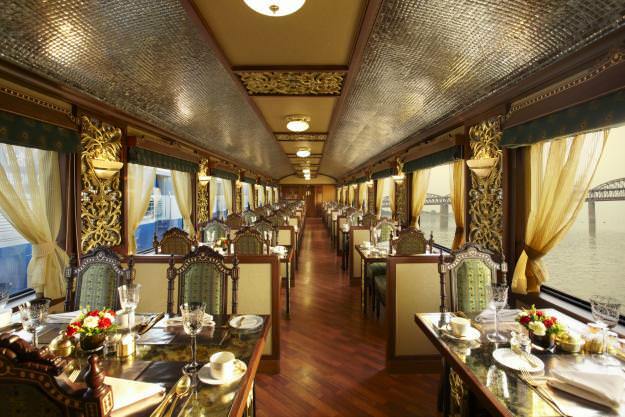 Return to Deccan Odyssey at Verna Railway Station for Lunch and leisure time. 12.45 hrs. to 15.30 hrs. Leave for Beach Side Hotel for Cultural Night and Dinner. 16.00 hrs. to 20.30 hrs. After dinner Depart for Madgaon Railway Station. 20.45 hrs. Return to Deccan Odyssey. 21.15 hrs. Over night halt at Vasco Station. Detrain for sightseeing by A/c. coach. Visit to Mhalsa and Mangeshi a Hindu Temples. 09.30 hrs. to 11.30 hrs. Visit Sahakari Spice Farm at Ponda. Extremely popular among tourists. See variety of genuine spices grown here with lot of knowledge. Traditional Goan style Lunch at farm. 12.15 hrs. to 15.30 hrs. Proceed to see 16th century heritage house known as Menezes Braganza House at Chandoli village. 16.30 hrs. to 17.30 hrs. Return to Deccan Odyssey at Madgaon Railway Station. 17.00 hrs. Departure for Kolhapur. 17.30 hrs. Arrive at Kolhapur Railway Station. 07.30 hrs. Detrain for Sightseeing by A/c. Coach. 08.00 hrs. to 12.30 hrs. Visit New Palace, Museum, Bhavani Mandap Mahalaxmi Temple & Shalini Palace- Watch cultural Programmes & Visit to Handicraft Stalls. Depart to Kolhapur Railway Station. 12.45 hrs. Return to Deccan Odyssey. 13.00 hrs. Depart for Daulatabad/Aurangabad via Pune 13.15 hrs. Arrival at Daulatabad Station 06.45 hrs. Detrain for Local Sightseeing by A/c.Coach. Visit Daulatabad Fortand Ellora Caves, A World Heritage site. 07.45 hrs. Depart for Aurangabad for Lunch 12.30 hrs. Lunch and free time at the hotel 13.00 to 15.00 hrs. Depart for local Sightseeing 15.15 hrs. Visit to Bibi-Ka-Maqbara and free time for shopping 15.30 hrs to 17.00 hrs. Free Time Onboard. 18.00 hrs. Departure for Bhusawal for Ajanta. 22.00 hrs. Early Breakfast on Board. 06.30 hrs. onwards. Arrival at Bhusawal Rly station 07.00 hrs. Detrain to visit Ajanta Caves A World Heritage Monument by A/c.Coach 07.30 hrs. Return to Deccan Odyssey at Jalgaon Railway Station 12.45 hrs. Depart for Nasik 13.15 hrs. Arrive at Nasik station & depart to Visit Panchwati Ghats and ancient Temples. 17.00 hrs. Return to the Deccan Odyssey at Deolali Railway Station and Dinner on board. 19.30 hrs. Depart for Mumbai 22.30 hrs. Arrival at Mumbai CST 07.30 hrs. Check-out latest by 08.15 hrs. 10% Surcharge shall be levied on departure during Christmas/New Year. @ 3.09% Service Tax shall be levied on the tariff of Palace on Wheels. Tariff is inclusive of travel/catering/conducted sight-seeing/ entrance fee at Monuments / Parks / Palaces / Cultural Programmes / Boat Ride.